This recipe is an oldie, but goodie! 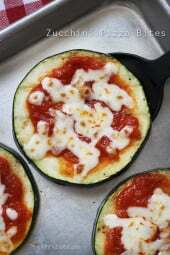 I had a big zucchini that needed using up and I was sooo in the mood for these yummy (and guiltless) zucchini pizza bites! 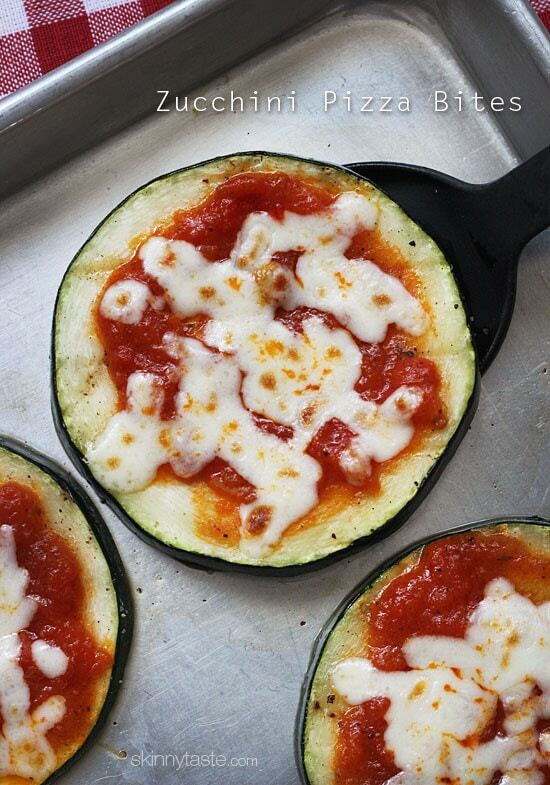 A perfect way to use up all the zucchini in your garden and satisfy your craving for pizza in a low-carb way. I make these all the time, sometimes for lunch or as snack. Even my husband thinks they are pretty darn good! They also happen to be gluten-free, and perfect for meatless Mondays. Of course, you could add some leftover sausage, pepperoni, basil, or whatever you like on your pizza. 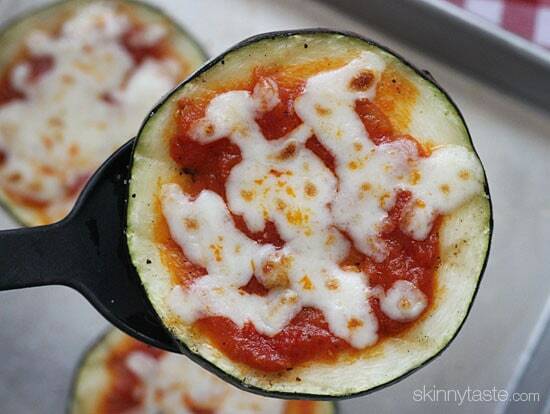 If you haven’t tried these yet, they are a must while zucchini is in season! Note: My zucchini was very large, if your zucchini is smaller, you can cut them on an angle for large ovals. 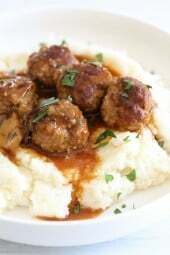 This recipe is an oldie, but goodie! I had a big zucchini that needed using up and I was sooo in the mood for these yummy (and guiltless) zucchini pizza bites! Cut zucchini about 1/4 inch thick. Spray both side lightly with oil and season with salt and pepper. Broil or grill the zucchini for about 2 minute on each side. Modified slightly from Green Light Bites. Would iit work also with an conventional oven. What temperature and how long? These were phenomenal! My toddler and I enjoyed them very much. Hoping hubby does too. Bomb way to get those veggies and squash a pizza craving. how do you think this would be with either eggplant or the yellow summer squash? trying to find new recipes/ideas for light dinners when it gets real hot and humid this summer. These are delicious! First I made them with the marinara and cheese and loved them and then made a second batch with turkey pepperoni slices under the sauce. I thought these were yummy without the pepperoni and with the pepperoni they were out-of-this-world delicious. I made them in my air fryer. So so yummy! I will make them again and again. Thanks for the wonderful recipe! What temp did you do the airfrier on and for how long? I was thinking of doing that, too. I know this recipe has been up for a while, but I just came across it. My question is, do you think this would work with yellow squash? My mom has a bunch of them in her garden, so I have been getting a lot of them too. My experience with squash vs zucchini is that squash is a lot soggier when cooked, so I don’t know if they would work for this. Instead of zucchini, I utilized squash and my family enjoyed the dish! Thanks for the inspirational recipes. I've been meaning to try these for months and just made them today. So, so good! The family had pizza last night (I had fish!) and that pizza box was taunting me in the fridge….until I remembered that zucchini I just bought yesterday. 🙂 This more than satisfied my pizza craving, and with a side salad I'm still feeling full 6 hours later. Making a trip to the store after work to pick up some more zuchs! Delicious. Just made these for my mother and she loved them. Added Italian herbs to them. Yummy!!!! yum! 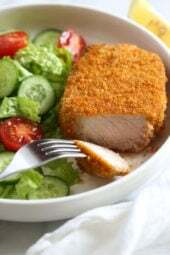 Had these tonight (with some added Parmesan cheese sprinkled on top) – delicious! 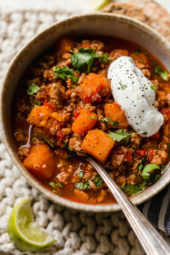 Admittedly, we are a family of veggie lovers, but my husband, my six year old, my one year old and I all agree that this recipe is a keeper! I used these at a nutrition workshop for kids last night and they went crazy over them! Out of over 80 kids, only 3 didn't like them! how long would you have to put them in if you split the zuch in half? I've done this before, but in the oven. When you put them in the broiler do they produce less liquid? Mine always turn out a watery mess (but still delicious). same happened to me and I can't figure out why. I sautéed the squash in a cast iron pan and then finished in the oven. I don't have a broiler so I bumped up the temperature to 500F. they were great tasting but they were definitely swimming in zucchini water. I know this recipe is ages old, but I just HAVE to comment. The other night, my family ordered pizza for dinner. My plan was to eat 1 slice of pizza and then fill up on these bites. The bites were SO incredibly delicious and filling that I was able to pass on the regular pizza. I have never passed on regular pizza in my entire life. I seriously LOVE these bites and can't thank you enough for your recipes and this blog. You are the best! Delicious, the only thing I added was red pepper flakes…YUM! This was yummy! I made these in our toaster oven at work for a nice healthy lunch. I even made extras for others. Mmmm, these were delicious! My daughter and I had them for a light lunch and we were both pleased and satisfied. So easy to make, too!